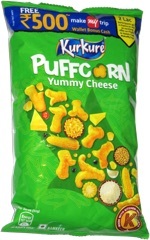 Taste test: This popcorn was crisp and tasted like a slightly jazzed-up version of Smartfood. 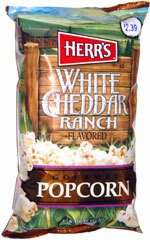 The taste was mostly white cheddar, with just a slight ranch twist to it, but the combination of flavors worked well and gave the popcorn a really nice taste. These earned high praise around the chip bowl. Smell test: Very nice! Mostly smells like cheddar popcorn, but there's enough ranch to really make it smell good.